This soft, lightweight jersey dress is a welcome travel companion: It’s stretchy, wicks sweat and has Polygiene® permanent odor control—in case there’s no time or inclination for laundering. Fair Trade Certified™ sewing. 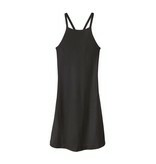 The high neckline on this dress protects your chest from the sun; an interior shelf bra provides support. The back is bikini-inspired with crisscrossing triple straps; a single layer cowl at the low back creates a draped detail. Drop tail hem hits above the knee; 2" side seam slits allow for movement.